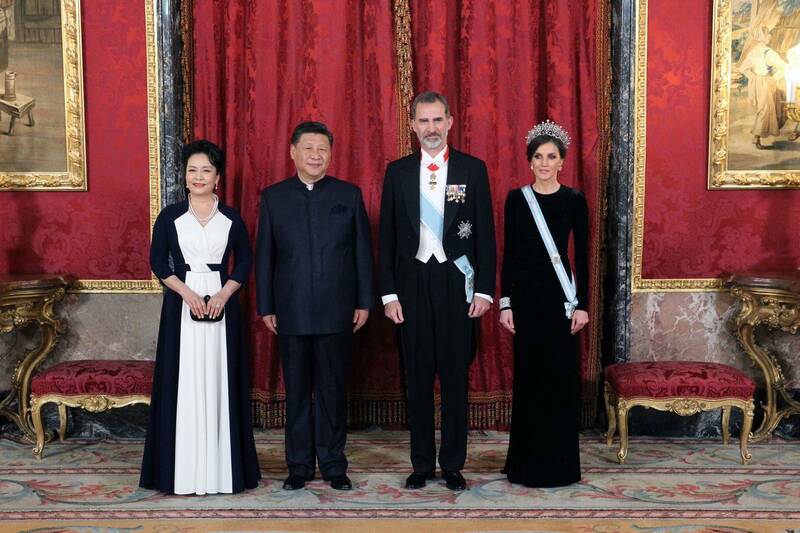 On Wednesday night, King Felipe and Queen Letizia of Spain hosted a gala dinner for the Chinese President adn First Lady, Mr. Xi Jinping and Mrs. Peng Liyuan at the Royal Palace of Zarzuela in Madrid. 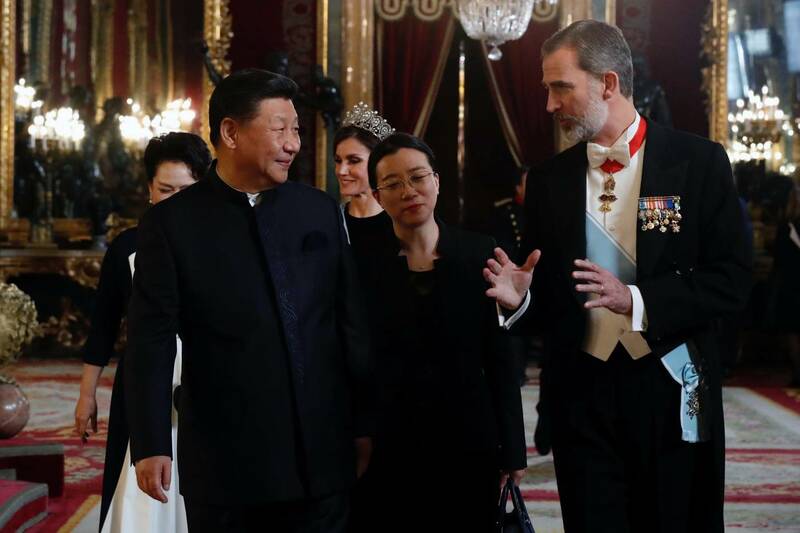 Chinese President Xi Jinping began a state visit to Spain on Tuesday with the aim of strengthening the preferential partner relationship that both countries have maintained for more than a decade and promoting business opportunities for Spanish companies in projects such as the Silk Road. 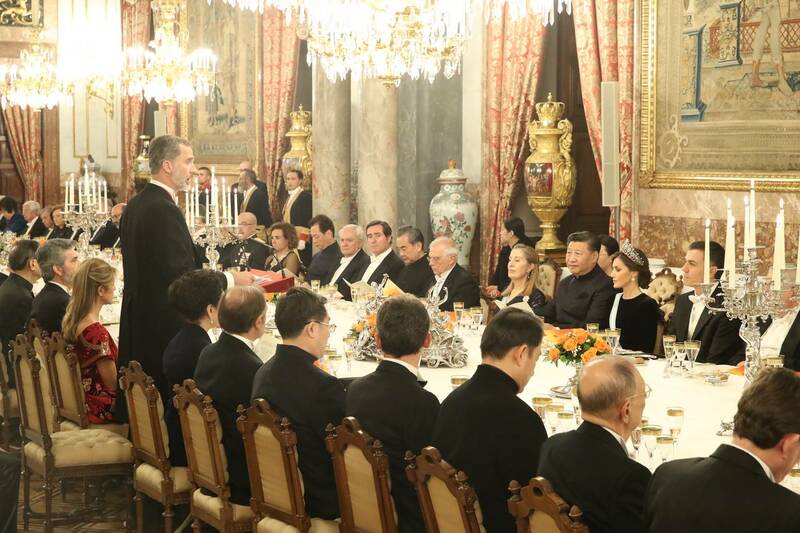 Speaking at the formal dinner, King Felipe said, “It is also the great progress made in recent decades, which has allowed us to build a structured, dense, and based on respect, mutual commitment to the principles of unity and national integrity, confidence and the desire to grow together“. 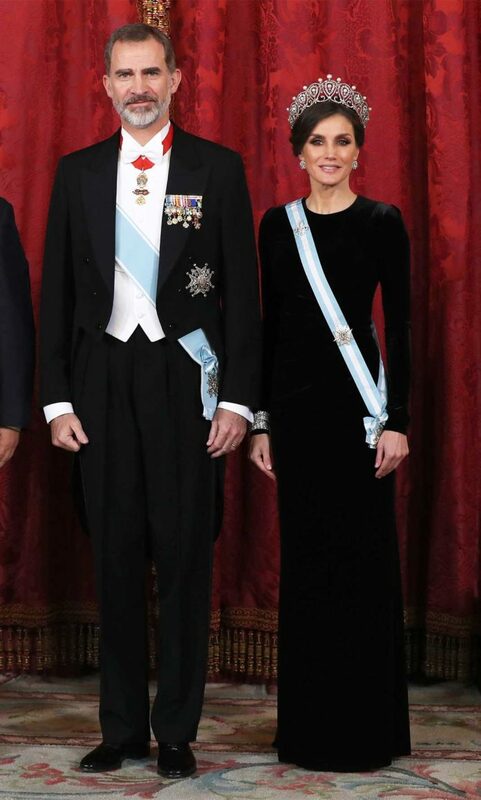 As the night was a white-tie event, I was expecting Queen Letizia bring back some dazzling jewels and surely she did not disappoint.She brought back black velvet gown that she debuted at the gala dinner hosted at the palace in the honour of Argentinean State visit in February 2017. Here a look at Queen wearing gown in 2017. The minimal gown was a perfect choice to showcase the dazzling tiara that she wore for the first time. A closer look at the gown. 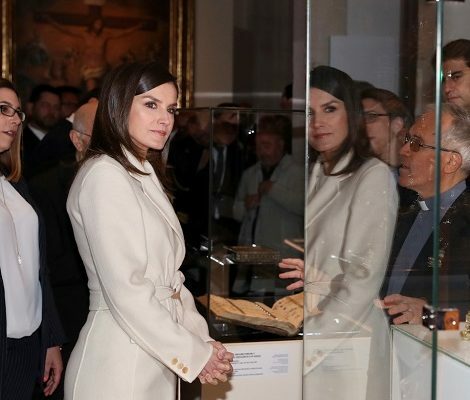 Letizia gave her look a more regal touch with the Order of Carlos III sash that she pinned with diamond Fleur de lys brooch. 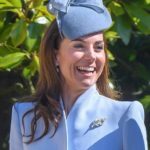 The brooch was made from the centerpiece of her “Princess” tiara. 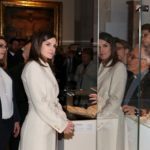 Letizia wore Queen Maria Christina’s Cartier Loop Tiara. The wedding gift to Archduchess Maria Christina of Austria on her wedding to King Alfonso XII of Spain in 1879. the diamonds and pearls set in platinum tiara was reportedly made by Cartier. From Order of Splendor, ” It features round pearls at the center of upright diamond loops, each loop composed of an inner ring of large round diamonds and a thinner outer ring. 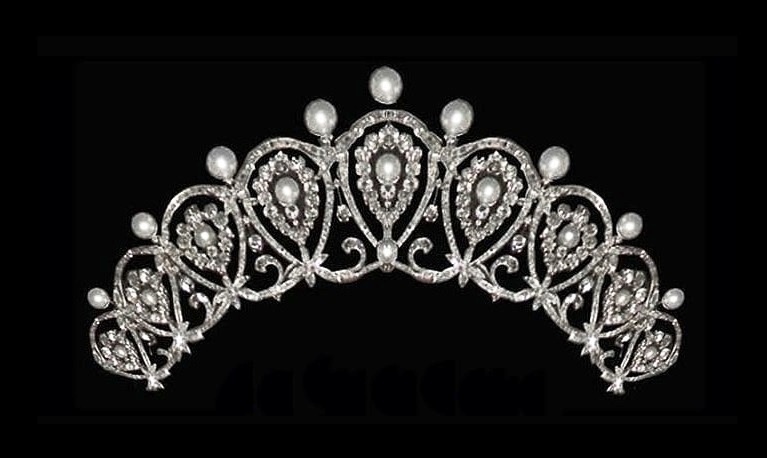 More round pearls top the tiara between each loop and in the very center.” Learn more about the tiara here. 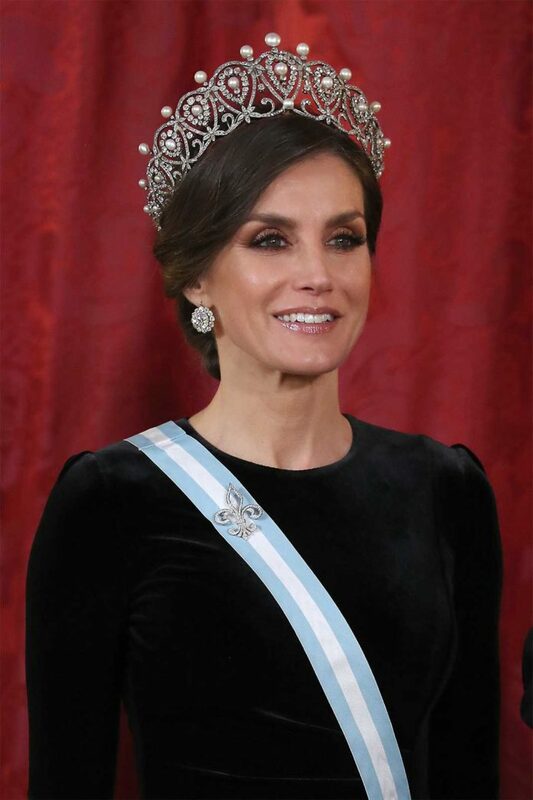 Queen paired the tiara with some more joyas de pasar jewels. She was wearing large chaton diamond earrings. Her double diamond bracelets were complimenting the whole look. 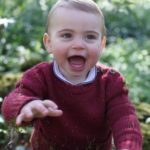 Through out the state visit Queen kept her fashion choices to minimal. 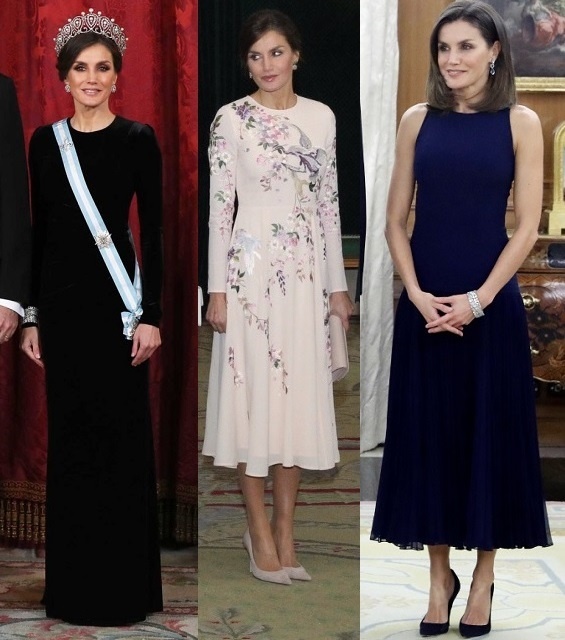 Today she brought back an old gown and yesterday she wore $119 Asos dress and on private dinner on Tuesday she wore Felipe Varela dress that she wore last year too.